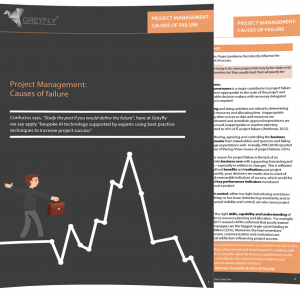 In 2018, Greyfly reviewed academic research and project management reports from independent organisations and professional bodies to examine and identify causes of project failure. This research was supplemented with interviews with senior delivery Directors and Managers to establish a consolidated view of the reasons for project failure. This guide provides detail into recurrent themes for causes of failure and have been split into organisational, project and external factors. Based on this learning we have then created our 7 foundations for project success used in our AI product suite.